You’re on Aaron Rodgers Fantasy Football Team Names – page 8 of 30 pages on Fantasy Football Team Names and League Names. See complete menu below. Aaron Rodgers, the Green Bay Packers QB, is so good that it’s only logical that Aaron Rodgers Fantasy Football Team Names are in high demand. A strong arm, great mobility and good decision maker. Despite only one Super Bowl win under his belt, is there really any other quarterback in the league you’d rather have? I didn’t think so. 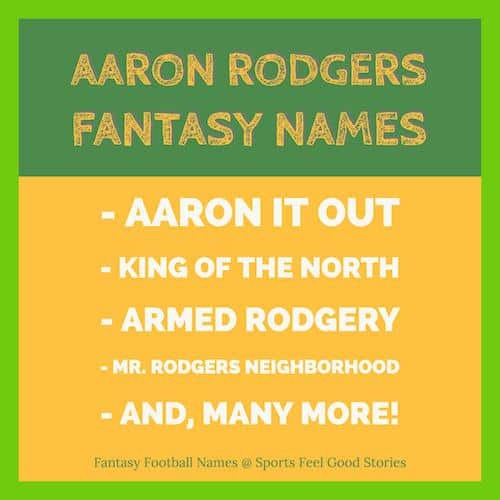 Check out our Aaron Rodgers Fantasy Football names. Aaron Rodgers seems to dispense more Hail Mary’s than your neighborhood priest. In the last couple of years, he’s had three memorable Hail Mary passes to score in the closing seconds of the first half or game. Aaron Rodgers finished in 9th place in the voting for the Heisman Trophy Award in 2004. Check out our Funny Fantasy Football Names List for 2015. It’s a Wonderful Day in Mr. Rodgers Neighborhood. Aaron Rodgers considered giving up football to be a lawyer when he didn’t receive a D1 scholarship coming out of high school. A fantasy football logo tied to your team name makes a nice statement. “The Jolly Rodgers” lends itself well to a logo with the old pirate flag. “Aaron It Out” with a football zipping through the sky in Hail Mary fashion is another good choice. “Armed Rodgery” could show a visual of Aaron in a throwing motion.